Over the course of the past three years e-paper has transcended the Kindle and expanded to other industries. You can view bus schedules, find out more about a piece of art in a museum or road conditions. A new agreement between E-Ink, HTC and Palladio will soon give us smart labeling for the pharmaceutical industry. 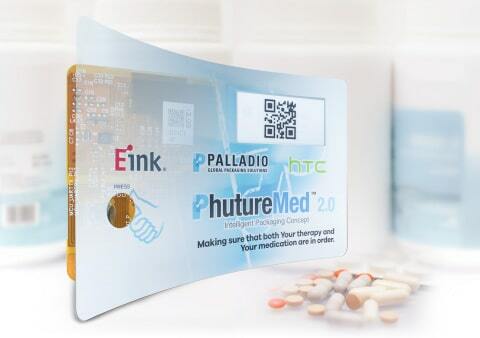 The smart packaging solution will integrate e-paper technology from E-Ink and it will work in concert with medication management software from HTC and be available through packaging developed by Palladio. There will be an app that you download to your phone that will connect to the smart labeling system via Bluetooth. The labels will display the contents of the package, reminders to take medicine, and records the time medicine was taken. This will make sure that the correct doses are taken. The management software tracks doses taken and records information on symptoms, side effects and evaluates therapy results to help patients consult their health care team, aiming to improve therapeutic effectiveness.